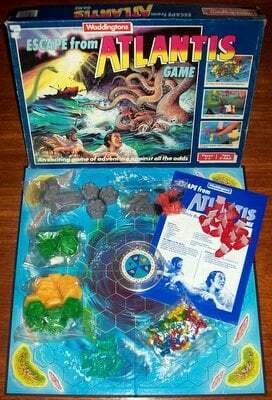 'ESCAPE FROM ATLANTIS' BOARD GAME: An exciting game of adventure against all the odds. The object of the game is to lead your tribe of Atlanteans in their daring escape from the doomed island of Atlantis to the safety of the nearby Coral Islands. The winner is the player with the greatest number of escaped Atlanteans at the end of the game. This game is a very nice example of a popular family classic. The box is in particularly good condition and the eye-catching artwork on its lid is vibrant and colourful. Most unusually for this game, all pieces are present and in excellent condition. This really is an excellent edition of a very, very fun game.